Francesca Curmi (second right) and Loudmilla Bencheikh are just one win away from reaching the Australian Open juniors final. 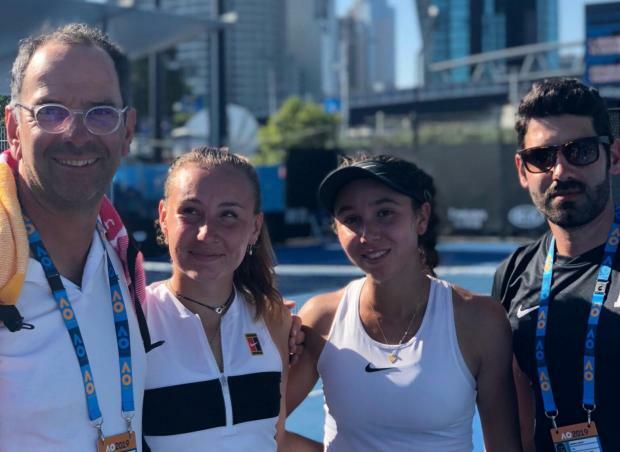 There were mixed fortunes for Maltese tennis players Francesca Curmi and Helene Pellicano at the Australian Open Juniors on Wednesday morning. Curmi and her French partner Loudmilla Bencheick came back from a set down to beat Thailand’s duo Thasaporn Naklo and Mananchaya Sawangkaew 7-6 4-6 10-7 to go through to the girls doubles semi-finals. On the other hand, Pellicano and Spain’s Marta Custic suffered an agonizing exit to American duo Chloe Beck and Emma Navarro 3-6 6-2 10-6. Curmi and Bencheick showed great resolve to come out on top against the tournament’s second seeds in a match that lasted an hour and 24 minutes. Their reward for their impressive victory is a semi-final clash against Adriann Nagy, of Hungary, and Japan’s Natsumi Nawaguchi who defeated Burundi’s Sada Nahimana and Moyuka Uchijima, of Japan. On the other hand, Pellicano and Custic will be distraught for their defeat against Beck and Navarro after they led the way after the opening set. However, the Americans stepped up their game in the second set with Custic and Pellicano starting to make too many unforced errors, most worrying nine double faults, that all but paved the way for Beck and Navarro to turn the match in their favour. In the semi-finals, Beck and Navarro will face Russia’s Daria Frayman and Italy’s Federica Rossi who overcame Australian duo Olivia Gadecki and Megan Smith 6-2 7-6.